Lewis Hamilton (GBR) Mercedes AMG F1 W09 celebrates at the end of the race. Lewis Hamilton went from 14th to first to seize a "miracle" German Grand Prix victory for Mercedes yesterday and retake the Formula One championship lead from Ferrari's Sebastian Vettel, who crashed. 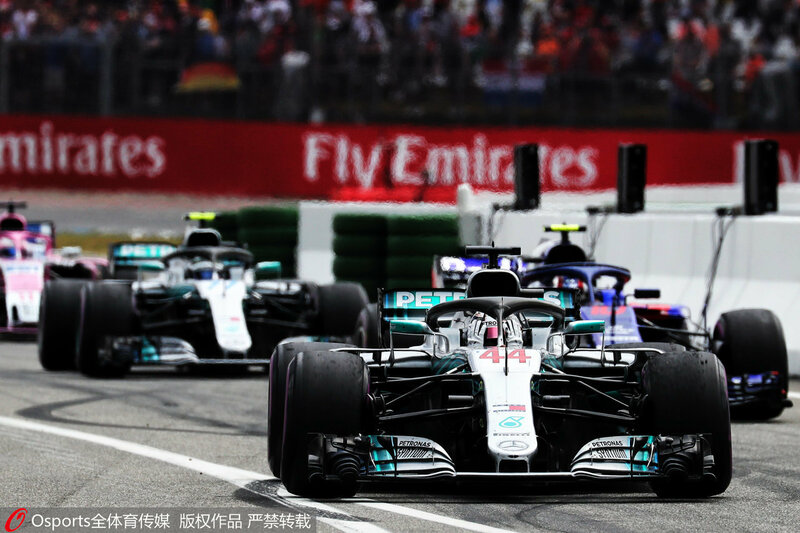 Reigning world champion Hamilton took the checkered flag, for a record-equalling fourth German Grand Prix win, ahead of his Finnish teammate Valtteri Bottas and Ferrari's Kimi Raikkonen, also a Finn. "It's obviously very, very difficult from that position and highly unlikely but you've always got to believe," added the four-time champion, who said a long prayer before the race started. For Vettel, it was simply a nightmare — the chance to make big gains slipping through his hands in an instant. He now has 171 points to Hamilton's 188.